A proven performer in it's class, the Powertec power rack is world renowned for being heavy duty and great value. 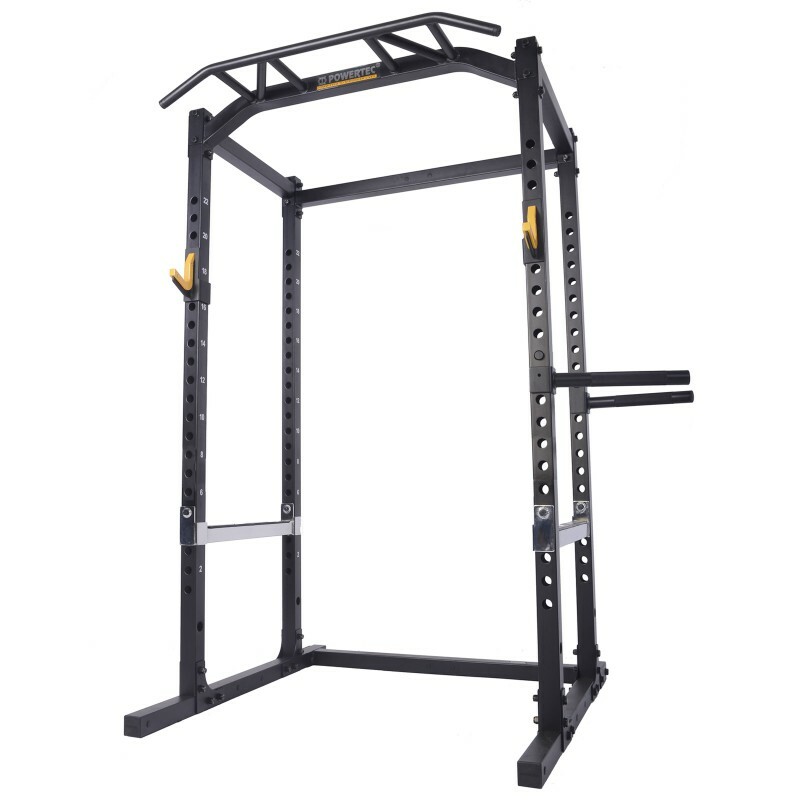 It's a 1,000lb (450kg) load capacity power cage with a home gym price tag! The quality construction and highly adjustable spotter bars let you train safely and save a few dollars without compromising on features. Warranty Lifetime Warranty on structural frame (excludes paint). Two year warranty on components (bearings, locking pins, pulleys, cables, slide rods etc). One year warranty on pads, grips and other unspecified parts. The warranty is for the original purchaser and for domestic use. This is a genuine warranty backed by genuine support and parts. Don’t be fooled by lifetime warranty’s offered by competitors. You can also see that the Powertec product lasts a lifetime by the age and condition of the 2nd hand units on sale. Carton Size Carton 1: 135cm x 54cm x 16cm Carton 2: 207cm x 28cm x 8cm. If shipping is required, someone will have to assist the driver unload these cartons, as they are both over the OHS limit of 25kgs. If you have been researching power racks online for a while you are probably confused as hell! The good thing about selling Powertec products is that we don't need to make any wild claims. This power rack has been sold around the world for over ten years. Its track record has been proven. You can see it for yourself right here as Mike squats 210kgs, and the cage holds the weight with ease. The Powertec Power Rack is the ultimate free weight training set up for the serious weight trainer. 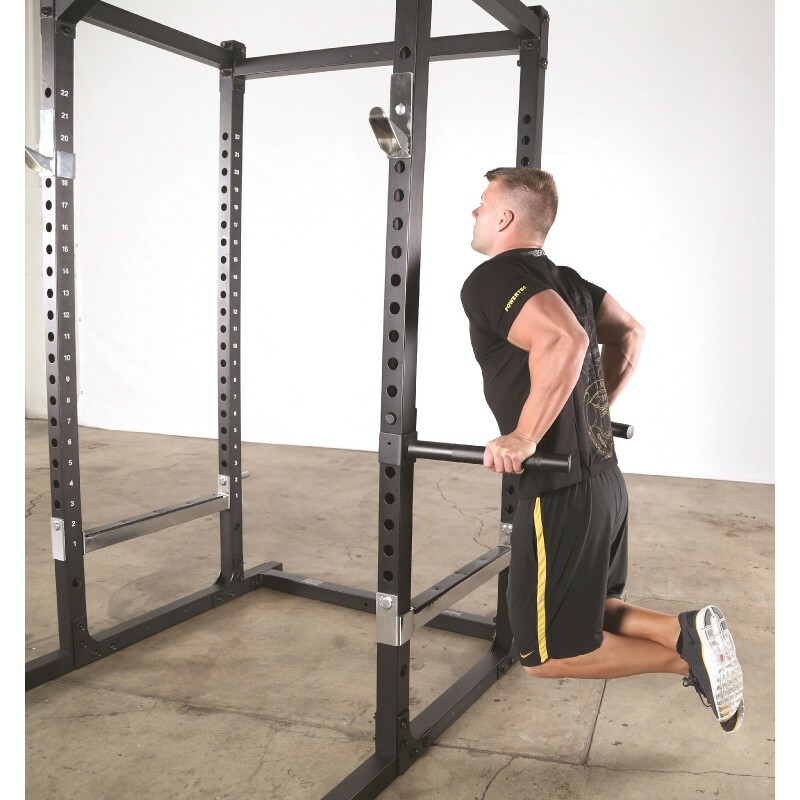 This simple yet heavy duty power rack allows you to perform all the great free weight training movements with complete safety. Training safely is one of the greatest concerns for people training with free weights, especially at home. Some gym equipment manufacturers have capitalized on this fear by coming up with complicated and expensive systems that allow you to train safely. These systems are great but Powertec have made the safety issue a lot simpler and much more affordable. We got Mr Universe, Lee Priest, to demonstrate just some of the exercises you can do on this type of set up at home. 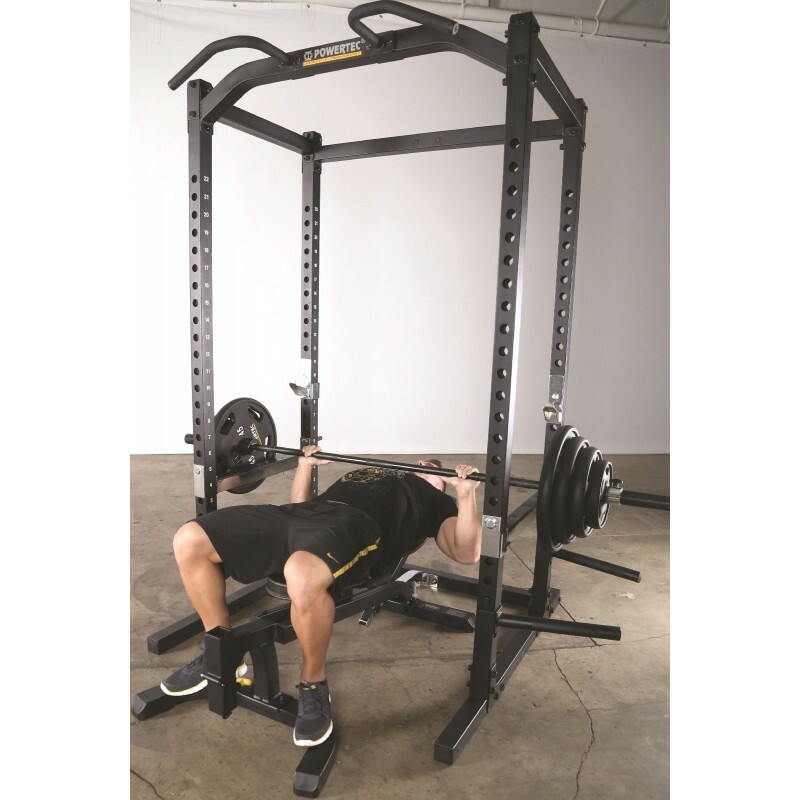 The Powertec Power Rack has adjustable spotter bars that can be moved into different positions for different exercises. For example for bench press you set them just below your chest line in your pressing position. You can still bench press with a full range of motion, hitting the chest, but if you can’t make that last rep you just simply rest the bar down onto the spotter bars. Just like the rack, they are rated to 450kgs so they are rock solid. It is great for squatting too. Just set the bars below your bottom point. You can squat until you drop! The holes for the spotter bars on the Powertec Power Cage are only 4cm apart so they can be adjusted to accommodate all shapes and sizes. The Powertec Power Rack comes standard with chin up bars and adjustable dip handles. 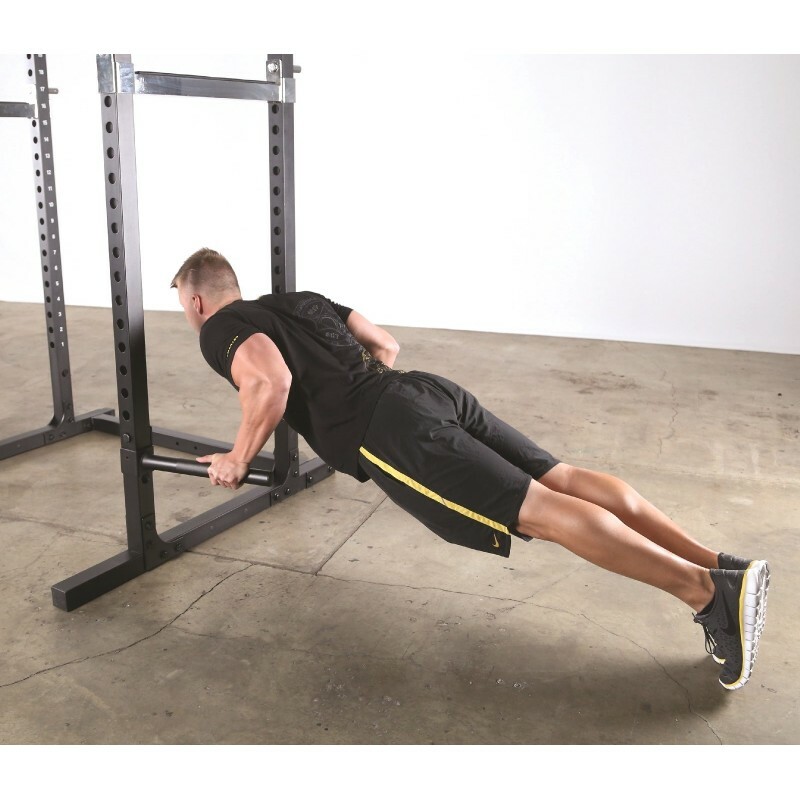 The dip handles are angled which is great for taking the strain off the shoulders and allowing you to lean forward and blast the chest muscles. 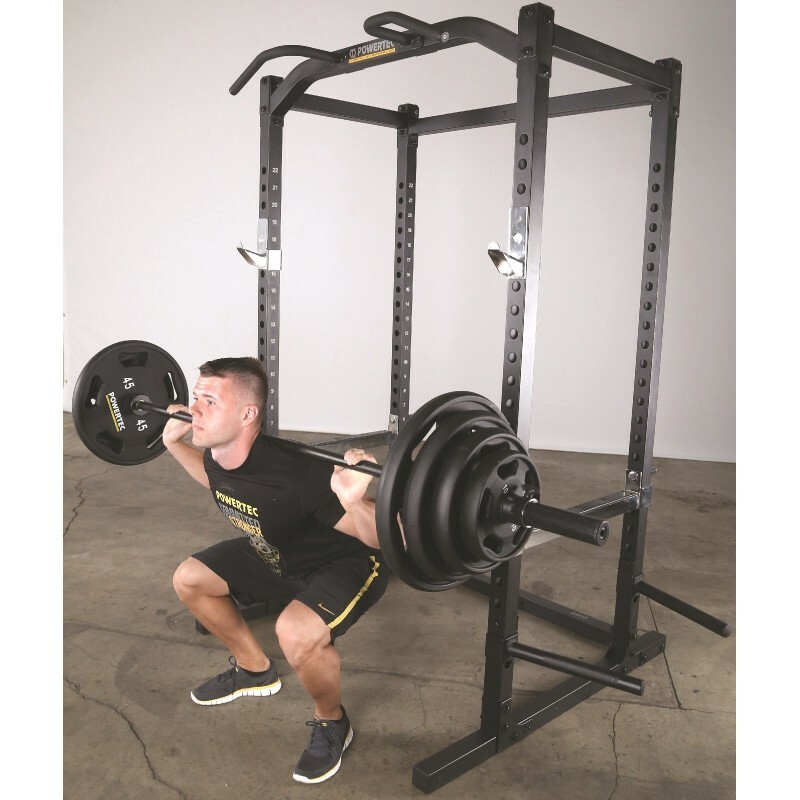 The Powertec Power Cage is very popular in the US and has earned a reputation as a great value set up for the serious weight trainer. This design has been sold for years in the States which is the toughest market of all. So if you are after something to really build some serious strength and muscle choose a unit that has stood the test of time. The Powertec Power Rack has backing plates all round, thick high tensile nuts and bolts which give it rigidity and a weight load capacity of 1000lbs or 450kgs. Olympic Barbell, Utility Bench and Olympic Weight Plates are sold separately. The docking attachment is also not included with this gear. 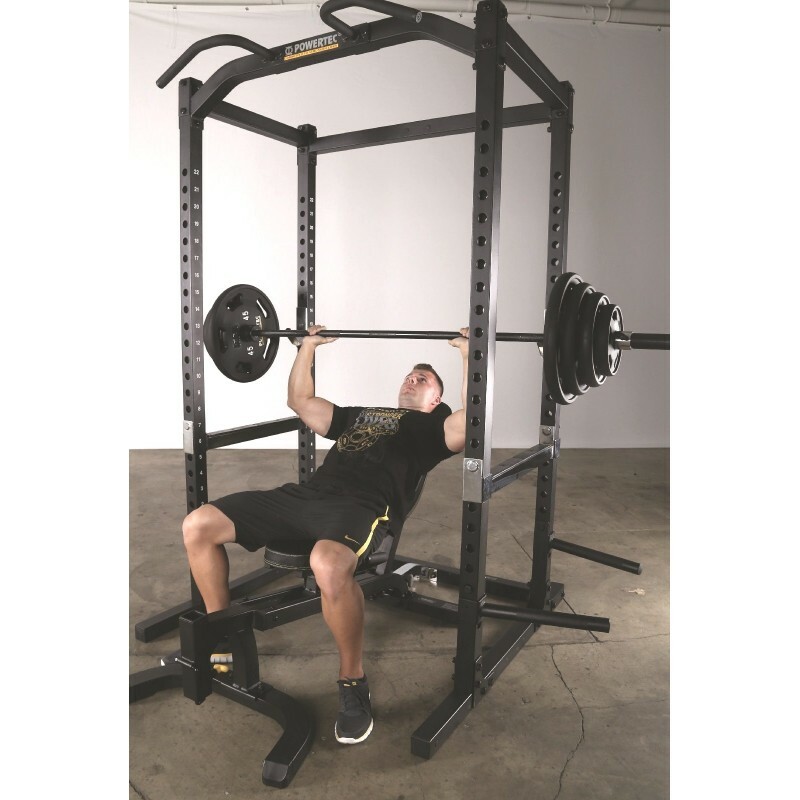 You can add the Workbench Lat Tower Option to the Powertec Power Cage which allows you to perform all high and low cable exercises like lat pulldowns, seated rows, tricep press etc.